Seven colorful princesses bring the colors of the rainbow to life just as in Barbie: Dreamtopia's Rainbow Cove! These adorable rainbow sprite dolls represent the colors of the rainbow with vibrant hair and outfits celebrating their colors: pink, red, orange, yellow, teal, blue, and violet. Each has a decorated bodice and a print skirt with a unique silhouette, and cute shoes and shaped hairpieces (like crowns, bows, or tiaras) complete their look. 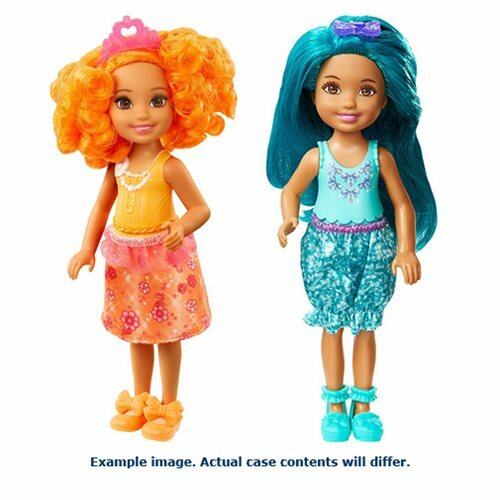 Young dreamers will love exploring new worlds and dreamy stories with these colorful rainbow princess dolls. Collect all the Barbie: Dreamtopia dolls and accessories, and let your dreams come to life! Colors and decorations may vary.